Hi all. I have two JTV59's which I love playing and which are both loaded up with Arislaf's "Realistic Bundle" (https://www.vguitarforums.com/smf/index.php?topic=24065.0). They pretty much do it all for me but there is one minor irritation ... changing strings. It's pretty tough to slot the strings in the bridge and then wind them on the tuning machine without having the string fall out of the bridge. There's a simple solution to this though. A piece of tape holds the strings in nicely until they can be wound up to pitch. Yes, this is the way that I normally do it as well. However, this time I was putting a set of locking Grovers onto the guitar and had all the strings off. I solved this annoyance using locking tuners. About $60. Pull the strings hand taught lock em in place so they stay in the slots. Hipshot fit nicely and they're better than stock Korean JTV59 tuners. Agree with Gin normal string tension and/or no tension makes no difference to a good neck. Unique to Variax legit reason to change 1-3 strings at a time is to minimize movement of the pickup saddles. Remember, there’s small signal wire attached to each bridge saddle and bridge assembly. Seems best to avoid any excess movement of that wiring. 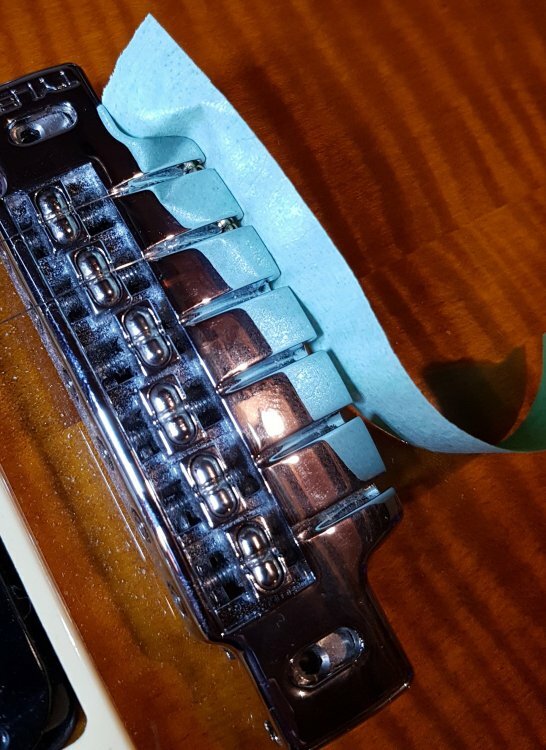 On the few occasions removing all strings on an old 500 will prefer to tape the saddles down in order to minimize movement while the strings are removed. JTV59 bridge is much less prone to individual saddle movement but do take care of the wiring from bridge. Agree with Gin and Jersyboy. There is no reason to worry about having no strings on the neck, at least for a short period of time. For a longer time you might want to straighten the neck with a truss rod ajustment and then re-set the relief after the new strings are on. A couple of reasons for removing all strings: oiling the fretboard to prevent cracking from excessive dryness (it’s *really* dry where I live, especially in the winter), leveling and crowning frets. I do all of my own guitar maintenance and most repairs and upgrades. I have so many instruments that it would cost a pile to have someone else do it ... and it’s kind of fun. Also, you know for sure that the work has been done the way you want it.